This gorgeous ivory or white ballerina length dress has a tulle skirt, which has been embellished with pretty floral sparkles. Comes with covered buttons, generous petticoat and a choice of coloured silk sash. 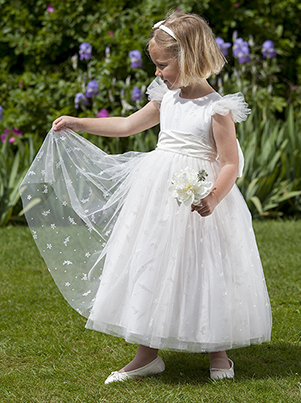 Perfect for Flower Girl, Bridesmaids and all special occasions. Shoes and hair band shown are available on our accessory pages. Please allow 10 weeks for delivery. We do however offer a fast track service, please contact us for more details. We are very pleased to announce that Nicki Macfarlane is under new ownership and we will shortly be back and fully operational For more information please contact us.